Goa on Sunday joined several other states in banning the sale of Nestle's instant noodle brand 'Maggi' which is at the centre of a raging nationwide row over food safety concerns. Chief Minister Laxmikant Parsekar announced the ban keeping in view a similar measure taken by various other states though Maggi samples tested by Goa's health regulator did not find any harmful contents in them. "Since Maggi has been already banned across the country, we have decided not to take a chance and ban it in Goa," he told reporters in Mapusa town near Panaji. "Though the results of Maggi samples tested in state-runFood and Drugs Administration's laboratory did not show presence of any harmful contents, the State Government has decided to ban sale of Maggi in Panaji," he said. He said government has already sent the samples of Maggi for further tests in a private lab at Mysore. The FDA earlier had tested the samples drawn from local market and also one sample manufactured in Punjab. Nestlé, the company which manufactures Maggi noodles, has a plant in Goa in Bicholim town. Parsekar said his government will also check the impact on employment after ban on the product in the state. Responding to a question, he said rest of the packaged food products of other brands would also be tested. "Indeed we need to check the other packaged food products," the Chief Minister said. 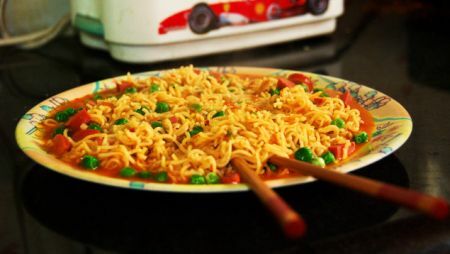 Several states including Delhi, Uttarakhand, Jammu and Kashmir, Punjab, Gujarat, Madhya Pradesh and Maharashtra have banned sale of Maggi noddles. Cracking down on Swiss giant Nestle, Central health watchdog FSSAI on Friday banned all variants of Maggi noodles terming them as "unsafe and hazardous" for human consumption.